Top 4 Habits You Should Never Skip From a Dentist in Washington DC! Pretty much everyone can agree that anything that helps them stay out of the dental chair is a good thing. For patient and dentist alike, the goal is always fewer fillings, crowns, root canals and extractions. But what’s the best way to achieve that goal? The answer is simple: good habits. It’s your consistent actions (either good or bad) that will determine the quality of your oral health. 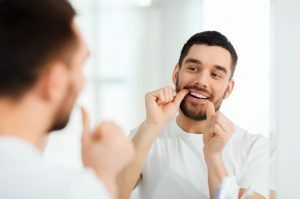 So if you want to minimize the amount of dental work you need from a dentist in Washington DC, keep reading to learn about the 4 most important habits you should have! There’s a saying in dentistry, “Sip all day, get decay.” That means that your risk of getting cavities is much higher if you eat or drink over a period of hours instead of in one sitting. Why? Acid is naturally produced in your mouth each time you consume foods or beverages. Just one exposure to acid is okay, but your teeth don’t react well to the constant exposure to acid over several hours, so try not to nibble or graze throughout the day. Good brushing is crucial for keeping your teeth and gums healthy. Many people automatically brush in the morning because they want to have clean, fresh breath before starting their day. But nighttime brushing is often more difficult for one big reason: It’s the time of day when everyone is most tired, so many people simply fall asleep before getting it done. If you can relate, you might try brushing (and flossing) right after dinner. Although it’s just a few hours earlier than bedtime, you’ll probably have a lot more energy and motivation. It also has the added benefit of discouraging nighttime snacking! When it comes to flossing each day, strive for better instead of perfect. Many patients think that they have to floss 7 nights a week or not at all, but that’s simply not true. Sure, flossing every day is ideal. However, if you aim to floss every day but only wind up doing it 4-5 times a week, your teeth and gums will still thank you! If you make it your goal to simply be better with flossing, instead of perfect, you won’t get discouraged and give up entirely. Also, once you’ve firmly established flossing even a few nights each week, you’ll get used to how clean everything feels and find that you naturally want to start doing it every night! Getting regular checkups for your teeth and gums is like taking your car in for tune-ups. It’s an opportunity for a professional to closely monitor your dental health and catch any potential problems when they’re small and less expensive to fix. By investing a small amount of time and effort into these 4 habits, you’ll be taking a big step towards having a healthy smile that’s easy to maintain for life! Dr. Yelena Obholz is a general, cosmetic and restorative dentist in Washington DC who knows that her patients’ everyday habits are crucial to their oral health. With a focus on prevention, she always helps her patients make good everyday choices so they can minimize their need for dental work in the long-term. If you have any questions, she can be contacted via her website or at (202) 364-8989. Comments Off on Top 4 Habits You Should Never Skip From a Dentist in Washington DC!